Twenty-Third Publications (New London, Conn., 2013). 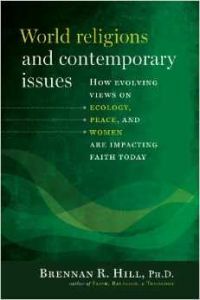 “World Religions and Contemporary Issues” is, overall, an excellent text suitable for use in adult education classes or undergraduate studies. Brennan R. Hill, the author, is professor emeritus in theology at Xavier University and his experience in teaching shows in the format and ease of use and readability of the book. Hill begins with an overview of various approaches to the study of religion — sociological, psychological and theological — and the major components shared by all religions — beliefs, rituals and morality. The book examines in some depth these aspects of the five major world systems of belief, Hinduism, Buddhism, Judaism, Christianity and Islam. For each, he narrates its history, insofar as this is known to contemporary scholarship, its core beliefs and hopes for how its followers can achieve its religious goals, personally and societally. He speaks of the modern movements of each tradition as it has coped with factors such as rational, scientific thought, the massive migrations of peoples over the globe resulting in an intermingling and encounter of their followers with those of other faiths, often a reality not envisioned by the founders or the sacred texts upon which their traditions are based. Each religious tradition is, finally, probed for its views, often evolving, on the key social issues on which he has chosen to concentrate: responsibility for the world and its ecology, both nationally and globally; issues of war and peace, nonviolence and restrictions on violence between individually and between groups; and the role of women both within their religious institutions and structures, and in the larger world. Given the role of religious traditions in shaping so much of humanity’s views on all of these issues, and in the case of war and peace all too often in fostering and rationalizing war, the studies and comments which the author makes can be illuminating and, at times and rightly, disturbing for religious readers of the work. Underlying all of the narrations, however, is a sense of hope, of progress being made in these areas, if too often only fitfully and as yet incompletely. While I would recommend this book, I would note a few areas where those who may use it in classes may want to correct some of his assertions and fill in on others. Hill describes the Judaism of Jesus’ time in too negative a fashion, seeing it as severely discriminatory against women. Though Jesus can be considered, in a real sense, a feminist, Jewish society of his time, as best as it can be constructed, was not as he portrays it necessarily patriarchal. It was not a means of discrimination against women, as he wrongly asserts, to require ritual baths after menstruation. Male Jews were required to take ritual baths as well. Women were not barred from studying the Hebrew Scriptures nor kept in illiteracy, as he falsely states. As rabbinic Judaism evolved from its Pharisaic beginnings, in fact, women were equally taught to read and write and to study Torah. Though they were not obligated to study post-biblical, Talmudic texts, they were not barred from doing so.